The owner of a cafe with a no children under 12 policy has hit back at critics calling for a boycott of his shop. 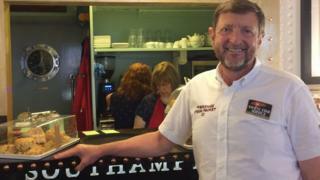 The Chart Room, in Brixham, Devon is an ocean-liner themed coffee lounge which also houses antiques and collectables. Bob Higginson said it was designed for people to experience the "opulence and splendour of early steamship travel without distraction". But resident Wendy Moore said she would be boycotting the cafe, and calling on others to do so. "Can anyone tell me just what kind of town we're living in when dogs are allowed into an establishment and children are not?" she wrote. "Who on earth does this Bob Higginson think he is? Would he ban disabled people from entering his premises? Or people of a particular race or colour or religion? I'll bet my bottom dollar he wouldn't; he'd be frightened to death to do so." But Mr Higginson says the policy has been "blown out of proportion". "I simply wanted to create a nice quiet zone where grown-ups could sit, relax and enjoy the quiet atmosphere," he said. "There are plenty of other places for people with children to go. "It's not like I've launched a ballistic missile over Torbay." Mr Higginson said he has received "a hundred messages of support" since the "unfounded accusations" were posted online. He said that with so many precious antiques on display, he was "quite nervous" about small children being in the coffee shop.